Steady loud booms rupture the looping noise of the waves lapping the coast of Pandeglang province on Indonesia’s Java island. The thumping sound could easily be mistaken for the wind – but it’s not. Hidden in the gloom some 47km out in the sea, Anak Krakatoa volcano is still erupting, like it has been doing for several months now. The powerful tsunami washed away popular seaside areas frequented by local and foreign tourists ahead of Christmas, sweeping over coastal settlements and leaving behind a trail of destruction.The latest death toll stands at 373 people, with 1,459 others injured and another 128 missing. Thousands more have been displaced and forced to seek shelter in temporary camps after the menacing waves flattened their homes. “I don’t know what I’m going to do,” Ami Yati told Al Jazeera. Her house in Pandeglang is above four metres above normal sea level, yet the surging water powered into it as well as her shop next door. With Anak Krakatoa still rumbling, experts are warning that more destructive waves could slam the already-stricken areas in southern Sumatra and western Java – and with as little warning as Saturday’s disaster. “People are nervous along this coast, watching the sea for signs that another wave could come,” said Al Jazeera’s Andrew Thomas, reporting from Pandeglang. Across the coast, in South Lampung on Sumatra, the same feeling prevails. “We’re scared that another tsunami could hit our village of any time, but we grew up here and our ancestors always told us that Krakatoa was a threat on the horizon,” Abdulrahman, the head of Rajabasa village who like many Indonesians goes by one name, told Al Jazeera. On both islands, search and rescue teams are using heavy machinery, diggers and even their bare hands to comb the ruins of hundreds of houses, hotels and other buildings. At a small resort on Java’s Carita Beach, rescuers on Monday recovered some 40 bodies during the recovery and cleanup operations. “They are still working in the rubble, where there is still a smell of death – they know that there are still at least one or two bodies to be recovered here,” Al Jazeera’s Rob McBride, reporting from the scene, said on Tuesday, adding that the efforts are being hampered by bad weather. For many in the most recent disaster zones, grief is turning to anger as they question whether more could have been done to alert them to what was coming and urge authorities to invest in better monitoring equipment. “I want the government to help us so we can continue to live here, so we are not afraid any more,” said Hasbialoh Asnawi, a resident in Anyer district on Java island. Indonesian President Joko Widodo, who on Monday visited affected areas, pledged to have all tsunami-detection gear fixed or repaired. In a post on Twitter, Sutopo Purwo Nugroho, spokesperson for Indonesia Disaster Mitigation Agency (BNPB), acknowledged that Indonesia’s network of detection buoys had been out of order for the past six years due to vandalism and budget shortages. But other officials and experts have said the tsunami was caused by Anak Krakatau, which means that the BNPB’s sensors could not have been picked up the volcanic activity as they can monitor the conventional tremors that are responsible for the vast majority of Indonesia’s tsunamis. “It’s highly likely that there will be more tsunamis generated by submarine landslides. The question is, when’s that going to happen? We don’t know,” James Goff, professor of tsunami research at the University of New South Wales in Australia, told Al Jazeera. Saturday’s tsunami was Indonesia’s third major natural disaster in just a few months. 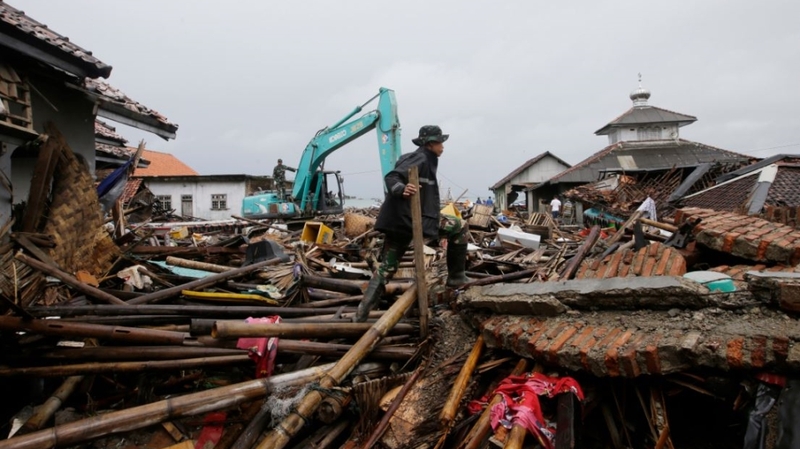 In July and August, major earthquakes on Lombok island killed hundreds of people, while in September a devastating earthquake-tsunami left more than 2,000 others in Palu on Sulawesi island dead. It also came just a few days before the 14th anniversary of the December 26, 2004 tsunami, one of the deadliest disasters in history that claimed the lives of some 220,000 people in several countries around the Indian Ocean, more than half of whom were Indonesians. As cleanup and recovery efforts following the latest disaster continue, the fears of people living on the coasts of Java and Sumatra – in such close proximity to the rumbling Anuk Krakatoa – will linger. “A number of the people who lived here at sea level are now in temporary shelters on higher ground,” said Al Jazeera’s McBride.